Wow… it’s been three years since I decided it was time to get moving on my publishing career, and while it’s been a great ride, I’ll be the first to admit that this third year has been a rough one. I would say more, but at the moment I’m pretty wiped out. Which is my way of saying it’s been a rough few weeks. The last part of summer was rough, kid-wise, and then I had a week-long business trip that kept me busy each day from dawn to bedtime. (I admit, though, that the trip itself was pretty fun.) Alas, a week with the kids solo left my wife in not the best shape, and then to pile onto that, I came back from my trip with a burgeoning sinus infection. So, I’ve been on antibiotics for several days, and that included five days of fever, something I haven’t seen since I was a kid. I’ve been finally getting up out of bed some today with hopes of getting back to work tomorrow, though even that is going to be a struggle, energy-wise. So, anyway, it’s been a rough year, writing-wise, which is sad, because I had set out with such high hopes. I’ll update more in a few days when being vertical is not as much of a challenge. The numbers sucked, but they’re not the whole story. I only wrote about 30,000 words in July, with about half of that on social media. There’s probably about another 5000 words in there that didn’t get counted, and I’ve got some edits underway for Debts of My Fathers. The bulk of that 5000 words is some world-building. 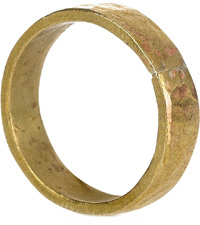 As I’m working on the edits to Debts – and after completing the drafts to the third book, Oaths of My Fathers – I’ve realized that there are some history elements that I want to include in Debts so that it’s not all backloaded into the final books. That also means finally converting some of the back-story elements from vague ideas into more concrete words. I need to confirm a couple of dates and numbers, but then the brief histories of the Republic and the Confederacy will turn into a series of blog entries here. I’m also making some improvements in my health. I’ve been back on the treadmill pretty regularly for about a month now. Quite some time back, I started on a project to walk a thousand miles. Both for my back and because of a history of anxiety and depression, I need to be walking more, some of it brisk cardio and some of it slower. Well, with some other problems and distractions (including a treadmill that had so many defects that it was eventually replaced by the manufacturer), that’s been a slow trip. However, I’ve been going well the last month or so, and if I can keep it up this month, I’ll pass through the 500-mile mark in early September. I’m currently hoping to get Debts of My Fathers out in December. It still needs a lot of work, but at least now I have a good plan for what that work needs to be and how to get it done. I also have to admit that yesterday’s apparent suicide of Robin Williams hit me kind of hard. I don’t feel like talking about my own bout of depression today, but it reminds me that life is painfully short, and that I don’t want to get to the end with nothing to show for myself. 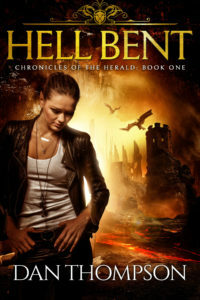 In other news, I’m getting ready to rerelease Beneath the Sky with a new cover. It’s a significant improvement, but I might still revamp it again down the road. I’m also hunting for a cover artist to do the rest of the Father Chessman series. I’m reasonably happy with the cover for Ships of My Fathers, but I don’t think I’m capable of what’s needed for the rest of them. I suppose I should also say something about the whole Amazon-Hachette thing, except to say that I don’t really have a lot to say that is my own. I’m not really on anyone’s side, except to say that Amazon has treated me better than Hachette, Patterson, Turow, or Preston ever have. I think I’m far better off with Amazon than I’d ever be with Hachette, and in that world-view where everyone else is Just Like Me – you’re probably guilty of this as well – I think most of Hachette’s authors would be better off on their own. That doesn’t really have anything to do with this pricing dispute between Amazon and Hachette, but it doesn’t predispose me towards Hachette or those shilling for it. In the meantime, I’ve got books to write and kids to raise. I was at ApolloCon recently, and because I had tried to book the hotel at the last minute, I ended up in the hotel across the street where I ended up in the middle of a very different kind of convention. It was a reunion for people who immigrated to the United States from a particular village in India. I got the impression that this wasn’t something they did every year but that it was not the first such reunion either. There were probably 300-400 villagers at the reunion, and I have to say it had a great vibe. It was like being at a giant family reunion where everyone had grown up in the same neighborhood. When we arrived on Friday, everyone was pretty casual, but most everyone – the younger generation especially – were all in the same colored t-shirts, printed up specifically for the event. Then on Saturday and Sunday, we were treated to all their finery from back home, and with the various things scheduled, they must have gone through three of four wardrobe changes each. Not even the Klingons and Star Trek miniskirts across the street could hold a candle to these folks. So it got me thinking about the sci-fi equivalent of such a thing, and it kind of blows my mind, especially when I run the numbers. 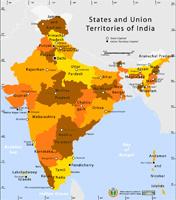 Villages in India range from perhaps 500 to 10-15,000 people, but India has a population of 1.2 billion people. I had thought at first that the sci-fi equivalent would be like having a reunion of all the Texans living on Latera. But if you scale the village size up the appropriate amount to make it the same percentage of the Earth’s entire population, it’s not a state. It’s a town of 30-50,000. It’s not Texas. It’s Pflugerville, a small suburb of Austin, Texas. So it would be like pfour hundred Pflugerville pfarmers getting together at hotel in downtown Stonefall pfor a pfestival, and I think that would be pfreaking pfantastic! Trust me, if you lived near Pflugerville, you’d think it was pfunny. But more than that, I think it would add some great color to your colony worlds. The only challenge to it is the large range of places our villagers could go in the great human diaspora. The villagers I ran into only had a world population six times bigger to blend into, and the US represents about four percent of that. If you include all the children of the old Republic in my sci-fi universe, there are well over a thousand worlds for our villagers to head off to. But they might still end up clustering together. After all, if ever get to emigrate, I’d be tempted to go to the place where my brother-in-law manages the spoo smokehouse. Of course, by the time I’d have that option, I probably wouldn’t even be on Earth. My hypothetical self would be few dozen generations down the line living on some far-flung colony already. So while Stonefall might never get a huge influx of pfolk pfrom Pflugerville, it would still likely have a section down south by the docks known to the locals as Rigeltown. Golly, I’ve been quiet here lately. Mostly I’ve been heads-down, focusing on this new job. It’s not that it took all my time, but it definitely left me scrambling about, trying to find new ways to manufacture writing time. (FWIW, the answer is at least partly “additional child care”.) Anyway, something had to go, and when it came down to blogging vs. working on new novels, blogging got put down like a rabid dog. Hmm, my brain apparently thinks it still has fictional people to kill. Anyway, I have been making progress on fiction. 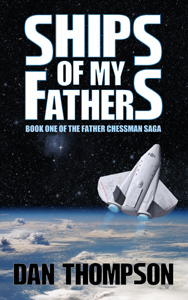 Today I finally finished the draft to Oaths of My Fathers, which is book 3 of the Father Chessman saga. 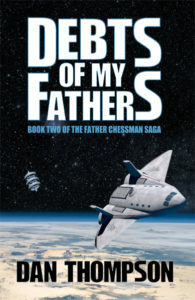 I always like to write the sequel to a book before I do my final edits, so that means I can now go back to work on Debts of My Fathers, which a number of fans have been… well, pleasantly insistent that I finish off and get into their hands. So, that’s coming. 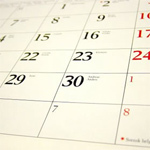 I’ve missed three announced release estimates in the past, so I’m holding off on dates for the moment. Anyway, let’s look at the numbers. In May and June, my writing rate was down significantly. In May, I wrote only 20,918 words, and in June, only 33,443 words. This is down from around 50,000 words a month towards the earlier parts of the year. For the year, I’m at 239,682 words, which now has me on a track to come in under 500,000 words. Again, blame the job. On the other hand, my autistic kids now have good health insurance, so yay! The words were split similarly to earlier in the year, except that I’m doing more private journaling. It’s not that I’m having lots of deep thoughts. Rather, I’ve found it’s a good way to warm-up my brain for writing narrative. I can do free-form writing for five to ten minutes, and then I’m up to speed on turning thoughts into written words. If I go straight into the narrative, that can sometimes take twenty to thirty minutes, and lately, twenty to thirty minutes is all I can grab in one slice. So, I’ve thought about trying some blogging here as part of that warm-up rather than strictly doing private journaling, but I cannot do the kind of blogging I used to do in that format. Specifically, I had been doing defined slots. Monday was an article about something in the SF/F genre. Wednesday was usually writing-related, even if it was just to say that I was neck-deep in bloody edits. Friday was reviews. As you can see, I haven’t been managing that very well this year. So I’m giving serious thought to going free-form. There are a number of things I could talk about, but I frequently don’t. Either they didn’t fit into a slot, or they touched on the unholy trinity of blogging flame: politics, religion, or … Hmmm, I can seem to remember the third. It seems like there should be three. Anyway, rather than dash something off, I’d spent almost as much time convincing myself not to write it, or at least not write it for the blog. That may be changing soon. I’ve long been a fan of John Scalzi’s blog, “Whatever”. First, he does have good content, but mostly I admire his willingness to blog about, well, whatever. So, when I say I might be looking to his blog for inspiration, it’s not that I want to copy his style or his topics. It’s that I want to feel more free to blog about whatever strikes my fancy and not censor myself so much. I do this knowing that I’m more likely to attract some annoying flame-puppies or haters, but I’m all right with this. I’ve long been a believer that blogs are different from shared public forums. They are not the town square. Blogs are the author’s living room, and I have always believed that in my house, it’s my rules. So I won’t have Scalzi’s Mallet of Loving Correction, I have no qualms about using the tools at my disposal. Hopefully, such incidents will be mercifully rare. So that’s it for now. There will still be articles on things in the SF/F genres and writing/publishing news, and I will continue to post reviews. But they’ll be mixed in with a bit more what’s happening in the world around me. Well, there’s no two ways to cut it. April sucked for me as a writer. No, no bad news. I just did not perform well as a writer. I’ll trot out the standard excuses of a lot of travel and a bunch of fires to put out, but the honest truth is that I didn’t make it a priority. Yes, I got a lot of other “necessary” tasks done, but they came at the cost of writing time. Total writing for the month was 35,465 words, of which only 7000 or so saw the light of day. That’s less than half the pace I was shooting for, and only about 60-70% of what I managed in the previous months. So definitely not so good. What’s behind that drop-off? I got a job. A local company made me an offer that was actually quite good. It’s for programming, which is how I paid the bills most of my life, and given the situation at home with my special-needs kids, they’re going to let me telecommute. That won’t be anything new, since I did that for a decade at my last programming job. However, that meant that I spent a lot of time this month getting my home office back in shape for taking on a programming job. I’ll confess to a certain degree of vanity here in that I didn’t want to do videoconferencing until I’d had a chance to reduce the level of clutter in my office. It’s still far from perfect, but I’ve probably dealt with close to two cubic meters of stuff, from dead cables to old paperwork. So, now it’s merely a mess, not a an episode from Hoarders. I don’t want to say too much about the company. My job will not be an outward facing one, so I don’t want to find myself treading into accidental corporate communications. However, I will say that they’re working on a problem that has held my interest for a number of years, and I think their solution will make a positive impact on the world. Certainly it will help WidgCo sell more widgets in Widgetistan, but I think it will also make a difference in fields as diverse as medicine and NGO charities. This is actually good news for a number of reasons in my personal life. Even with the Affordable Care Act (aka Obamacare), it was proving difficult to get health insurance for my eldest son who suffers from fairly extreme autism. And even then, the options I was seeing in the plans available to me as an individual purchaser were not nearly as good as what I had at my last job nor as good as what seems to be coming with the new job. And then there’s the money. I’m pretty pleased with how well my writing income is coming along, but it’s nowhere near what I can make as a programmer – at least, so far. The extra money going to be nice for everything from hiring extra childcare to eventually doing something wild like putting solar panels on my Texas roof. But there’s also a silver lining for you, my readers. Most of my writing income so far has been paying for things like food and electricity. Now, that income can be poured right back into the writing career. That means I’ll be hiring out more editing services and cover artists, reducing my overall production time. I think I’ll keep the actual format/assembly for myself because… well, I like it and think I’m pretty good at it. 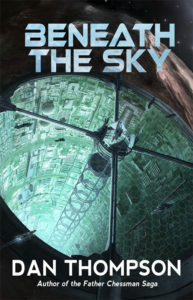 The first dividend from that is a tossed some money at a new cover for Beneath the Sky. It was partly just an experiment, but I’m also fairly happy with the result. I’ll do the reveal soon once I have the official files. Now, to update the schedule, it’s pretty much all bad news for you patient fans. The feedback from my beta readers is telling me I need to put in 40-60 hours of edits on Debts of My Fathers, and that will take most of May. So, right now I’m shooting for a mid-to-late June release. As for the rest, right now I’m crossing my fingers, hoping that the more rigid schedule of a full-time job is going to help me prioritize the writing time for when the time is actually available instead of letting little fires crop up and consume my days.